Whenever Nicole teaches a class, I try it out. I met Nicole, a dynamic, inspirational instructor at the Upper Valley Aquatic Center in December 2014 and she has changed my life in a very positive way. At 62 years old, I feel stronger and healthier than ever and I owe this to Nicole. She is the grand motivator who makes class fun with a larger than life personality. She does all of the exercises with you and has a big smile on her face when she pushes you to your limits. She is true superwoman and a great role model with the physical activity she does on a daily basis. I am in awe of what she can do. I take the Total Body Conditioning Class three times a week and I look forward to it on Monday, Wednesday and Friday. It is so popular that the participants get there 15 minutes before to set up their equipment so they can get a spot in the fitness room. We are getting so much stronger that more heavier weights have been ordered. Nicole listens to us and adapts her music and routine to our needs. 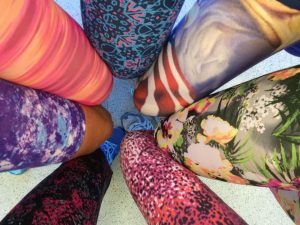 Did I mention Fancy Pants Friday where we wear our colorful pants to class? This started with Nicole making the class more fun and introducing the idea. Most of the people in the class know each other because of arriving early for class. I have made many new friends by attending this class. It feels like a big family supporting and caring about each other. Nicole started a Core and Stretch class that I attend and really enjoy it. It compliments the Total Body Conditioning Class. Since I have gotten stronger, I finally accomplished something on my bucket list for years. I ran a 5K with my daughter the end of August and finished it three minutes under my goal! I also can pick up my four grandchildren easily now. I highly recommend any class that Nicole leads! Yes, I am an admirer, her number one fan and am very thankful to her for she what she has done for me.